Toilets, showers, food, pub, limited parking, single use plastic cups are not provided for water. This will be the 34th running of Tigger Tor (so named as the route starts from Tigers RUFC and includes ascent of Higger Tor). The race starts and finishes outside the rugby clubhouse, which, on race day, always has a convivial atmosphere with pre- and post-race refreshments available. Showers and changing facilities are available. Set in a beautiful winter landscape, for many runners, who return year after year, this is a challenging and enjoyable curtain raiser to the season. However, if you have no prior fell running experience, you are STRONGLY DISCOURAGED from participating. This is because the course covers some difficult terrain and weather conditions can be severe. This race is held under FRA Rules. and runners must familiarize themselves with and comply with the FRA Requirements for Runners 2018 (the “Runners’ Rules”).It has a distance of approximately 9.7 miles with total climb of around 1,500 feet. It is therefore a category B Medium race (over 10 km but less than 20 km, average not less than 25 metres climb per km, not more than 30% on road). The locations of the checkpoints and the area defined as “out of bounds” are unchanged from last year. Most of the route is within a Site of Special Scientific Interest and formal consent for any large event is now required from Natural England. Due to severe environmental impact caused by other users, we were informed that consent would not be granted unless we avoided the area around the Ox Stones and the paths that lead to them. The area around Ox Stones (as defined on the race route map) will again, therefore, be out of bounds. The entry limit for this race is 440 and entry to the race will be closed if this limit is reached, or, otherwise, on Wednesday 23rd January 2019. This race is online pre-entry only – there will be NO entry on the day. Registered runners should present their kit for checking and collect their numbers at Tigers RUFC no later than 10:20 on the day of the race. Transfers of numbers will NOT be allowed on the day of the race, but, if you are unable to run, you can transfer your number to another runner prior to race day by following the procedure set out below:Original entrant sends an email from the account indicated on entry to archie@hartwright.org no later than Monday 23rd January 2017, naming the runner to whom the number is to be transferred. Replacement runner completes the on-line form no later than Thursday 26th January 2017. Archie will acknowledge that the swap has taken place by including the replacement runner in the list of registered runners. Checkpoints, as marked on the race route map, must be visited in numerical sequence. 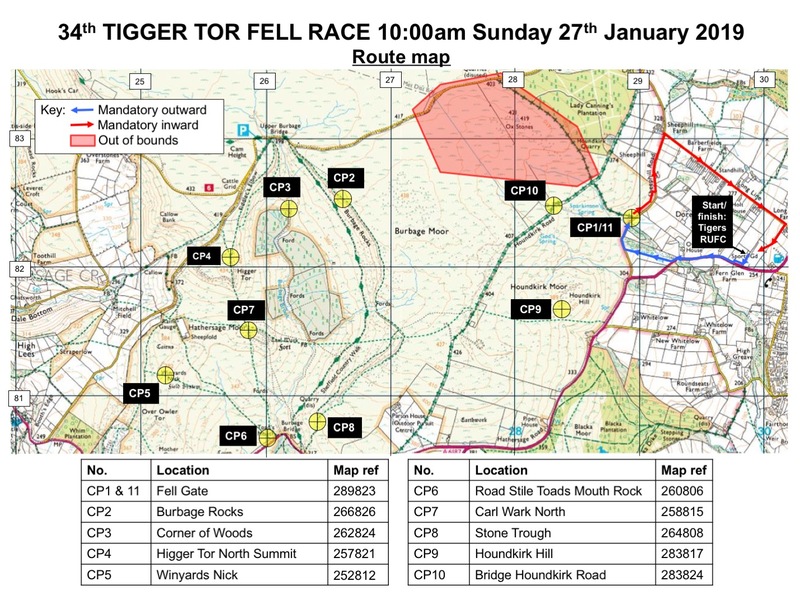 The route between checkpoints is optional but, apart from two short, marked, marshalled sections between Tigers RUFC and Checkpoint 1/11, must not involve running along roads. Competitors must find their own way to each checkpoint without external assistance. Marshals will do no more than indicate the general direction in which you should proceed on leaving a checkpoint. There will be no checkpoint at Ox Stones. As indicated on the course map, the area around the Ox Stones and all paths leading to it from Jumble Road and Ringinglow Road are OUT OF BOUNDS. This race is held under FRA Rules and runners must familiarize themselves with and comply with the FRA Requirements for Runners 2018 (the “Runners’ Rules”). Mandatory kit inspections will be performed on race day adjacent to the number collection desks. You will not be admitted to the start pen unless you have passed this inspection. A further check will be undertaken on completion of the race – anyone completing the race without the required kit will be disqualified and reported to the FRA. ‘FRA Mandatory Minimum Kit’ (waterproof whole body cover (with taped seams and integrated attached hood) + hat + gloves + printed map of the route + compass + whistle and emergency food) will be mandatory and any runner presenting non-compliant kit will not admitted to the start pen and no refund of race fee will be provided. Note that kit inspections will include checking that whole body cover is waterproof (windproof/showerproof kit e.g. Montane Featherlite will not be accepted). Please bring a reusable plastic cup if you would like a drink of water at the finish. Single use cups are not provided. Your race number must not be folded or cut down and, at the start, all checkpoints and the finish, must be clearly visible on your chest. Failure to show your number at checkpoints will lead to disqualification. Runners are not required to record their arrival at checkpoints in any way. The only requirement is that competitors must run past the marshals (without taking short cuts) with their race numbers clearly visible. GPS devices are not permitted for navigational purposes. You will need to visit the checkpoints in numerical order as marked on this map. The Garden Centre car park entrance is on Brickhouse Lane. When coming from the direction of Hathersage, there is NO RIGHT TURN into Brickhouse Lane. Instead, continue and turn right into Cross Lane, then right again into Brickhouse Lane. Once the available off-road parking is full, you will have to park on the road some way from the club; please allow sufficient time, park responsibly and avoid inconveniencing local residents. Leave M1 at Junction 33. Head towards Sheffield City Centre on A57, after Dual Carriageway becomes a 50 mph zone follow signs for Ring road and Services. Turn left onto the Ring road (A6102) . Follow the ring road for 4-5 miles until you come to the Meadowhead roundabout (clearly signed). Go straight across and get in the right hand lane, which turns right after about 100yds (signed for Castleton and Bakewell). At the bottom of the hill, at the roundabout, turn left. Through the next set of lights (at Beauchief Hotel), follow the road until you come to a T Junction, turn left (onto the A625 to Hathersage). Go past the Dore Moor Inn and the ground is the next right. Please allow sufficient time to park.